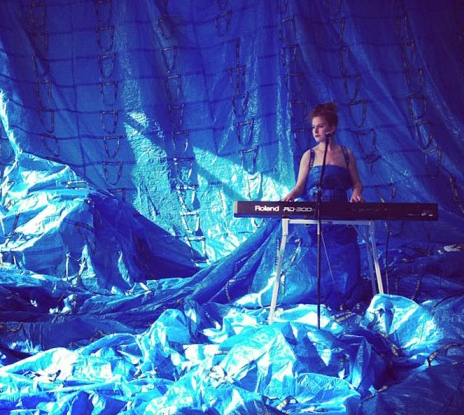 Discard Studies, one of my favorite garbage resources, shared this link today to a screening next week of the documentary Trash Dance. I just RSVPed. Here’s the trailer, via the film’s official website. A choreographer finds beauty and grace in garbage trucks, and against the odds, rallies reluctant city trash collectors to perform an extraordinary dance spectacle. On an abandoned airport runway, two dozen sanitation workers—and their trucks—inspire an audience of thousands. Sorry if you’ve had trouble accessing the site this past week. We’ve cleared up the issue and are back in business. Click here or the image above to “like” everydaytrash.com on Facebook. 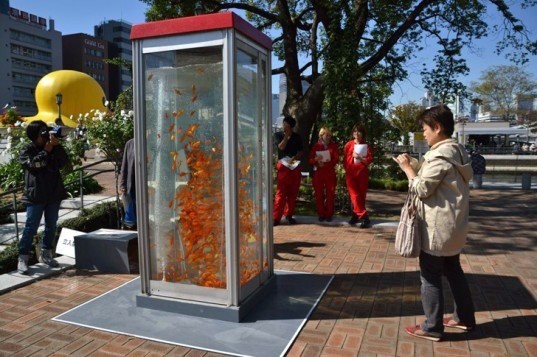 Facebook fans get updates on new posts, links to fun trash links from other sites and the opportunity to share links, photos, promote trashy personal projects and take part in an ongoing dialog about art and politics through the lens of garbage. Pass it on! 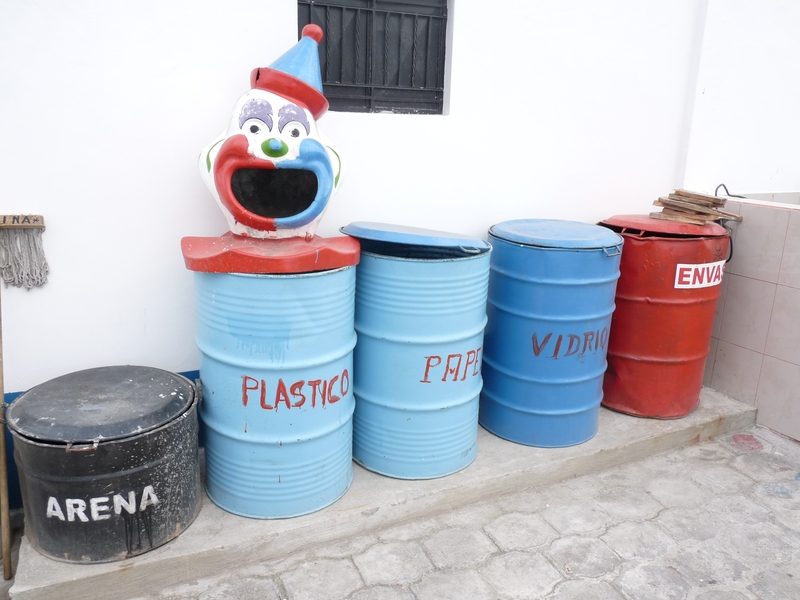 Apologies for the light posting of late, I’m in Ecuador this week for the day job, where the trash cans are seriously creepy. Updates on Latin American waste to come over the weekend. In the meantime, don’t forget to join the conversation on Facebook. In case you haven’t noticed, we’ve added a “share” button to the bottom of every post so you can pass on everdaytrash.com tidbits to friends and acquaintances who might also be interested. Use it! Attn: Ruby Re-Usable and Little Shiva. 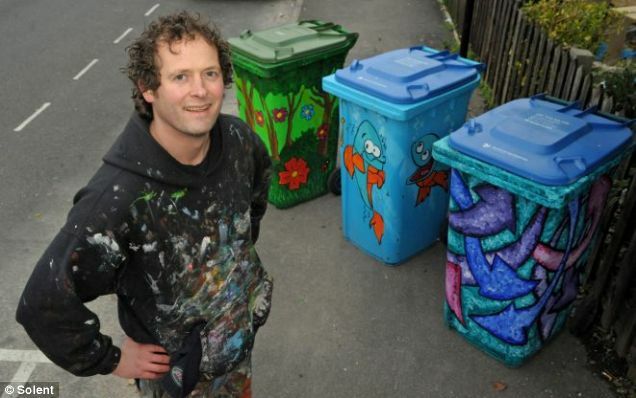 Looks like there are some folks in the UK we need to recruit to participate Decorative Dumpster Day 2011. I found this link, then Googled “pimp my bin” and discovered a wealth of hits like the YouTube video below. Amazing. Are you a fan of everydaytrash.com on Facebook? Check out our ever expanding album, Global Trash, made up of photos from Leila’s travels plus some amazing shots contributed by friends around the world. everydaytrash.com just made WE Magazine’s list of sites written by “101 Women Bloggers to Watch”! Mark your calendars, trashies. 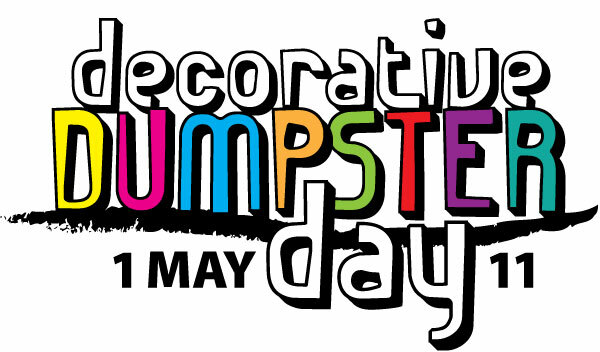 Decorative Dumpster Day 2011 will take place on May 1st across the garblogosphere. In case you forgot, DDD is the biennial holiday during which we take a moment to think about where we are depositing our waste by posting photos on blogs of decorated trash receptacles. Here are some links to the inaugural event. Logo by Little Shiva of the Visible Trash Society who, along with Ruby Re-Usable of Olympia Dumpster Divers and everydaytrash.com co-founded this special day. Pass it on and start taking photos. Apologies for the light posting of late. In the spirit of getting back on a regular schedule, I thought I’d first upcycle some posts from the past and recommend some of my favorite past snippets of trash info brought into my life by the blog. But first, I’d like to remind you that everydaytrash.com has a Facebook page. 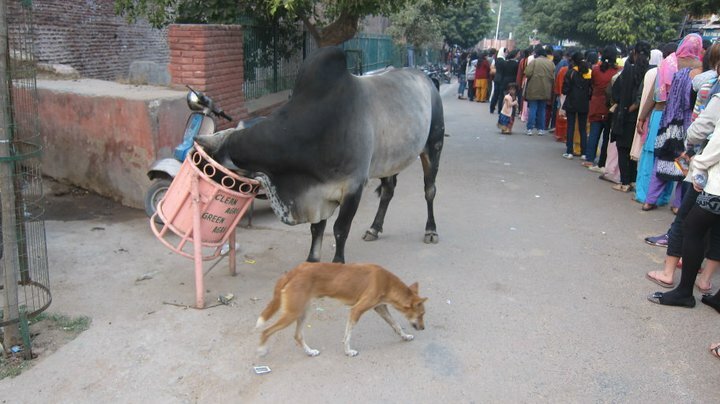 In addition to notification of new posts, we share interesting links and photos of trash from around the world such as this one from Agra, India (where I spent Christmas Day with my mother and sister). Show your love of trash by going to http://www.facebook.com/everydaytrash, becoming a fan and sharing the page with your friends on Facebook. Ok, end of pitch. While we regroup for 2011, please peruse these fond and trashy memories. 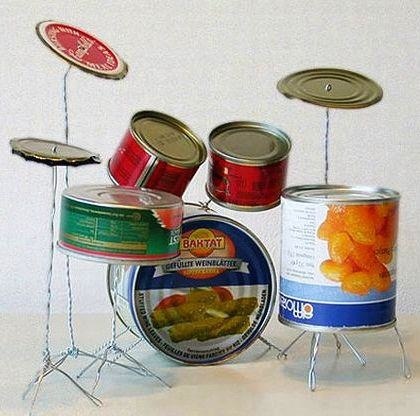 Indonesia beats, upcycled; Literary trash week; our entire Trashtastic Tuesday interview series; Decorative Dumpster Day; Trash Track; How the Fed disposes of old money; Joshua Harris’ bear and giraffe…and so many more. Check out the 4+ years of archives and stay tuned for new trash coming soon. Our Brazilian friend Joana sent us this link to the blog Global Garbage, which has some amazing photos of post-Carnival beach/ocean trash. UPDATE: here’s that link in English (thanks Fabiano!). Joana translates that Carnival in Bahia, Brazil this year involved a crowd of two million on the streets (20% tourists from Brazil and abroad) who generated a billion reais ($600 million) in profits and 30 tons of trash. 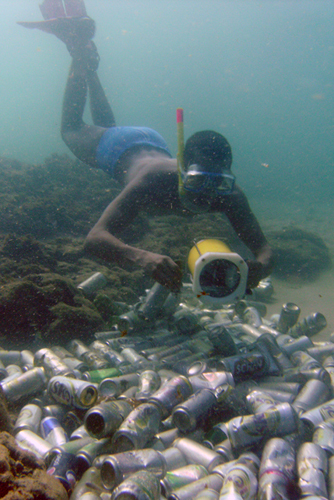 After the party, Catadores de lixo (Brazilian gleaners) collected cans to sell to local recycling companies, some going so far as diving in the ocean to collect the cans that ended up underwater. The source blog, Global Garbage, says and English version is coming soon. Can’t wait! Obrigado, Joana! Robin Nagle, anthropologist in residence for the Department of Sanitation, New York City, is both a favorite tipster and topic here at everydaytrash.com. Today’s Nagle-find is the very exciting news that the professor herself has entered the world of garblogging! Her nascent site, Discard Studies, aspires to become a nexus of trash scholarship, a clearinghouse of academics exploring questions of waste and a living bibliography of their work. We are VERY EXCITED to see this initiative take off. The success of the project depends on spreading the word. If you know of related work underway, in some shade of gray or already published, please pass it along. Garbologists unite! And in the meantime, check out the blog’s first few posts. Every single one is fascinating.